We are already into November and its looking like the weather has started to stabilize with spring like conditions finally upon us. There are already lots of airborne insects out and about and some fish are starting to look up! The larger rivers still have quite a bit of water moving and its looking like we might see some fantastic summer condition with plenty of water flow for most of the summer. 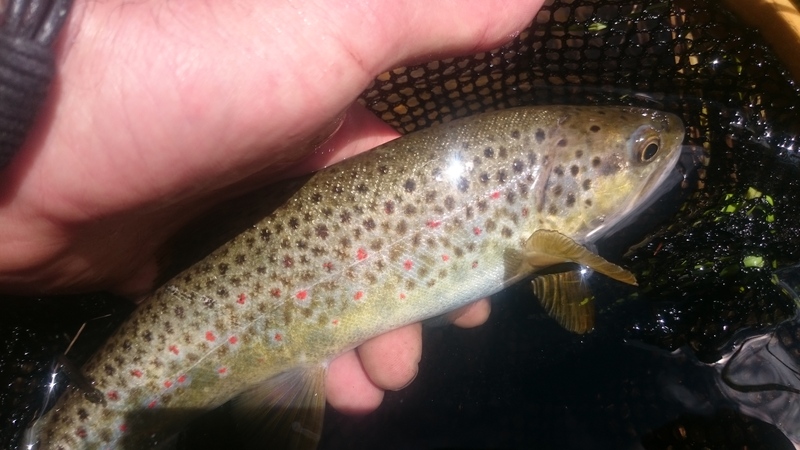 The smaller streams in the area are fishing very well with a dry and dropper combination. A bouyant emerger pattern with a unweighted nymph seems to be working quite nicely. In the deeper water a couple of nymphs fished a little lower in the water column should do the trick. The Thredbo river has been a little bit tougher in the lower section, with a couple of nymphs fished deep proving to be the most productive rig. The weather is warming up nicely and the fish will soon start to take flies off the surface very shortly. Parachute Adams, Kinlkhammers, and emergers will be the go-to patterns. Theupper sections of the Thredbo are fishing off the top very well, but a little insurance with a soft hackle or unweighted nymph will cover your bases. Over the past couple of evening we have seen some ant falls taking place, so be sure to have some ant patterns in your box for these times. A black spinner pattern that is lightly hackled is a great ant alternative. When fishing an ant hatch it’s very important to manage your drifts well, as there is usually quite a lot of naturals on the surface and the trout tend to really hone in on them, so make sure your presentations are spot on. Don’t get too frustrated though, as fishing during these times can be somewhat a challenge. The water level of lake Jindabyne is still quite high and we should start to see some nice fish cruising looking for food as the edges start to warm up. There has been quite a few bugs on the water. Caddis, Mayflies, Gum Beetles, and Damselflies are in good numbers. The lake water temperature is still quite cold from the snow melt and should start to warm sooner than later, So keep an eye out a few meters from the bank. Lake Eucembene has been a little tougher as the wind has been something to contend with. There are plenty of midge around with the odd mayfly and caddis also getting about. The water level has been quite steady and is covering some fresh ground. I think Eucembene should really start to fire up in the coming weeks. If your planning a trip to the lakes for a fish it would pay to practice casting in some windier conditions at home so your well prepared to tackle a gust. Things are really looking good for a great summer of fishing. From now on the fishing is just going to get better. We have a fully stocked shop with some fantastic new products at some super competitive prices, So don’t forget to call in for a chat and stock up on all the latest trout catching goodness!